The Emerald Tablet, also known as Smaragdine Table, Tabula Smaragdina, or The Secret of Hermes, is an ancient text purporting to reveal the secret of the primordial substance and its transmutations. 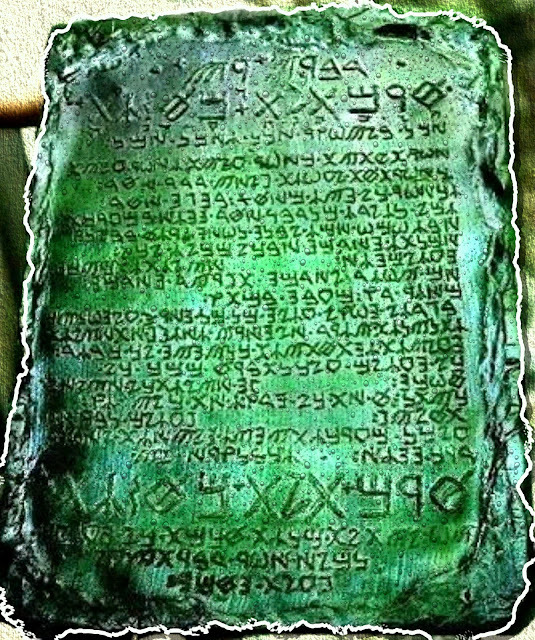 Its claims to be the work of Hermes Trismegistus ("Hermes the Thrice-Great"), a legendary Egyptian sage or god, variously identified with the Egyptian god Thoth and/or the Greek god Hermes. This short and cryptic text was highly regarded by European alchemists as the foundation of their art, in particular of its Hermetic tradition. 1. Tis true without lying, certain & most true. 2. That which is below is like that which is above & that which is above is like that which is below to do the miracles of one only thing. 3. And as all things have been & arose from one by the meditation of one: so all things have their birth from this one thing by adaptation. 7a. Separate thou the earth from the fire, the subtle from the gross sweetly with great industry. 8. It ascends from the earth to the heaven & again it desends to the earth and receives the force of things superior & inferior. 9. By this means you shall have the glory of the whole world & thereby all obscurity shall fly from you. 10. Its force is above all force, for it vanquishes every subtle thing & penetrates every solid thing. 11a. So was the world created. 12. From this are & do come admirable adaptations where of the means (or process) is here in this. 13. Hence I am called Hermes Trismegist, having the three parts of the philosophy of the whole world. 14. That which I have said of the operation of the Sun is accomplished & ended.